In a nutshell, Red Dwarf is a giant mining vessel out in space, returning from a mission and Dave Lister is the lowest of the low in the ranks of the ship’s crew. After sneaking a cat onboard (an illegal action because of disease), Lister loses his pay and is put in stasis for the rest of the trip, which means he is in something akin to hibernation where time doesn’t affect him. When he is awoken from stasis, Lister is horrified to learn it is 3 million years in the future, since there was a nuclear leak in the ship while he was in stasis that killed the entire crew and the ship could not return to Earth. Imagine, Lister 3 million years in the future, in an empty ship lost light years from Earth, with all of humankind probably gone. See, what I mean about dark? I dare you to think of a gloomier, more hopeless existence than that. At least Ned Stark got to live a little first. All Lister has for company is a humanoid that has evolved out of his cat, a robotic servant, and a hologram based on his annoying bunkmate. Let me say this again- this is a comedy. There is always a comparison between The Hitchhiker’s Guide to the Galaxy and Red Dwarf. It is hard to avoid it. Both follow what is probably the last human in existence as he explores what is out there in the universe. The one glaring difference is while in Douglas Adams’ vision, the universe is crowded with aliens and adventures and the possibility of love; in Red Dwarf there is really nothing to find, unless it was somehow created by humans in the past. And the girl you hope to woo, chances are, died millions of years ago, so good luck. See, we humans are, or were, all that existed in the universe; and since Lister really doesn’t happen upon other earthlings, we should probably lean towards the “were” in the first part of the sentence. This is a story of an atheist alone in an empty universe, burdened with the responsibility of possibly restarting the human race (also he might be his own father, but that is a little complicated to get into). Smeg, I lov… like this show a lot. Watching Red Dwarf now, it is like an early Who’s Who of British television. Heck, even my first BBC America crush appeared in the show (Sarah Alexander from Coupling). Of course, now that I am happily married I do not have BBC America crushes, so let’s move on…. Oh, and fun fact, for a time the brilliant Eddie Izzard used to warm up the audience for the filmings. From 1999-2009, this show was nonexistent, no new episodes on the horizon, and I first found Red Dwarf during this decade of the void. Those ten years of no activity probably mirrored in many ways what Lister probably sees outside his ship’s windows every day since his awakening from stasis. No hope. Nothing. What made this pause in filming so painful for us smegheads is that the last episode said, in so many words, to be continued. Either Doug Naylor (the co-creator and grand guru of the series) was pulling off the greatest (or most evil) tease in all of television, or something else was going on. It was then that Dwarf fans became something like evangelical Christians looking (and hoping) for any signs of a “return” to come and save us. I’m surprised we didn’t become excited by the faces of characters in toast like people do about the Virgin Mary in Brazil. And while an apocalypse sounds interesting, this has a little less of the “end of all things” vibe to it… This is irony, since the show is about the “end of all things” so while one… Okay, nevermind, you get it. And like the devout, we would hang on every little piece of news. Oh, there were rumblings of a movie screenplay fighting for funding (that would have reset the story), random pictures, and always positive and supportive quotes from cast members; and we happy believers would analyze each for proof that something was afoot. Frankly, all we were missing was a church. At the time I first found the crew of the Starbug, I was living in a small studio apartment with my brother in Los Angeles; and, in many ways, if it wasn’t for this show the world might have ended up one fewer Southard boy by the end. We both became obsessed around it, rewatching episodes, debating it with each other, quoting our favorite lines (most were from Cat), and using the word “smeg” whenever we could. In many ways if I had followed through with the threat of writing for TV while I was at the University of Southern California, I probably would have created a show like this. Not a science fiction piece perhaps, but an idea that starts off with an outrageous and unpredictable plot concept while really being a show, at its heart, about the characters and their comedic interactions. Don’t believe me? Listen to my award-winning comedy radio series, The Dante Experience (here). That was written years before I discovered Red Dwarf. It is close to kin. Of course, unlike all religions, we actually did have a return! Hallelujah! So that would be one point for us, right? 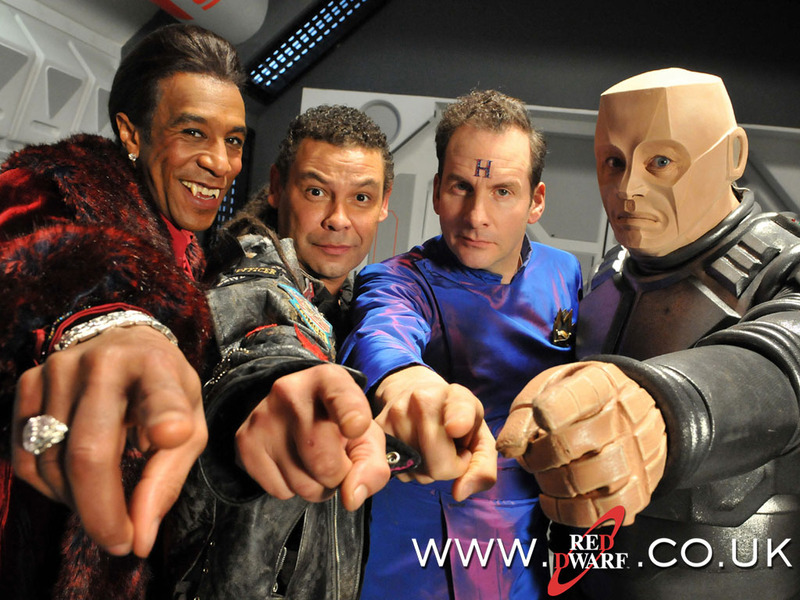 In 2009, Red Dwarf returned on a station called Dave (Named after Lister) in a special called “Back to Earth.” And because of the success of that outing we are getting a new season; 6 brand-spanking new episodes to watch in 2012.
Who knows? With these six new episodes of Red Dwarf we might see a rebirth of the series. Look at Doctor Who, that changed from a cult following to a more seriously popular series (I get the series recommended to me all the time); that could happen to this beloved work! What a glorious thing it would be when all of the world knows the joy of Red Dwarf and…Oh smeg, this probably was a love letter…. If you liked reading my article, why not check out some of my books? I had two novels published in the last few years, My Problem With Doors and Megan. You can find them via my amazon.com author page here. Thanks for reading! This entry was posted in TV and tagged BBC, BBC America, Cat, Comedy, Coupling, Dave, Doctor Who, Douglas Adams, Grant Naylor, Kryten, Lister, New Season, Red Dwarf, Rimmer, Smeg, The Hitchikers Guide's to the Galaxy, TV, Worship, Writing by Scott D. Southard. Bookmark the permalink. Nice article. 🙂 I’m also based in LA, but don’t have cable – so I’m keeping fingers crossed that KOCE will pick it up as they have in the past. BTW: You do know Channel Dave is not really named after Lister? Ha ha ha. Yeah but in Back to Earth they claimed it was so I’m sticking to it. Then you would definitely enjoy the (spoiler-free!) RDX set reports at Ganymede & Titan. Check them out at http://www.ganymede.tv – they’re in the “in depth” column. I love Red Dwarf, but hate Blade Runner. That’s why I have mixed feelings about Back To Earth. No problems with the series at all (even VII and VIII have more than their share of hilarious moments) and no problems with Doug on his own as a writer. I’ve managed to stay somewhat spoiler-free so far on series X, although from the little trickles I’ve heard on Twitter from people who attended the recordings, it’s supposed to be hilarious. Reading other Dwarf fans opinions always interests me since I liked 7 and 8 a lot. I seem to be solo on that in some regards. Thanks for reading my article! And I think I’d forgotten how bleak the show really was. That’s a really solid point! But sometimes I think the best comedy has an underlying vein of tragedy. One small correction, America extended RD in its second series it was such a hit on the PBS network BBC management went beyond 3 series. And yes the American version was never shown because America can not make a English comedy. I haven’t seen a British comedy that the Americans did that was as good as the original. Sadly to say Original thought is gone out of American TV.